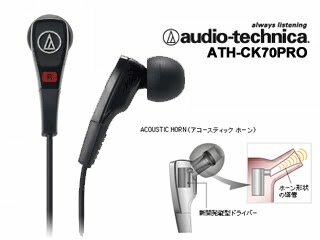 Audio Techinca announced the new single balanced armature based CK70Pro in Japan, featuring the same 'acoustic horn' nozzle as its bigger but dual driver brother, the CK90Pro. Interesting enough, it also has the top-firing BA that first appears in Ultimate Ears' Super.fi 5 (or currently, the UE600). As always, the MSRP is a little over at about US$220, but the actual street price can be expected at much lower price point. New Products for UE, or Are They?